Shi Yi walks out from a lift into the busy lobby of the Ritz-Carlton hotel, wearing flip-flops, black jeans and a blue tee. Except for the two Chinese characters zhongyi (loyalty) emblazoned across his top, nothing about the bearing and demeanour of the young man screams for attention or hints of an attitude. However, Mr Shi - who wears nerdy glasses and sports a boyish mop of hair - is anything but an unremarkable, run-of-the-mill millennial. Only 28, he has been on Forbes' list of the 30 most important entrepreneurs under the age of 30 in China since 2014. He is the founder of DotC United Group, which has several global business platforms: digital advertising, mobile games, app development as well as an investment fund for mobile start-ups. Formed in 2015, the group landed a whopping US$350 million (S$475 million) in Series B funding in June. In addition, he founded several other businesses, including local bike-sharing firm oBike, which has a market presence in 11 countries. Mr Shi is a millionaire many times over but one with an interesting perspective on wealth. "If you have accumulated enough, you are just keeping it for other people. When you have more money than you can use in your life, you should think about using it to better society and other people's lives," says the serial entrepreneur who has already set up a foundation in a leading German university to fund innovation. The elder of two sons, he was born in Shanghai in 1989. In the same year, his father, a former translator and interpreter, left for Germany to study German and English literature. He was joined by his wife two years later. Mr Shi was raised by his maternal grandparents until he was 11, when he left Shanghai to be with his parents, who were then running a Chinese restaurant in the town of Neu-Ulm. Enrolled into a local school, he was the only Chinese kid in his class. "I knew a bit of English but no German. So my mother gave me a Chinese-German dictionary and a 20-year-old German grammar book," recalls the self-starter, who spent his time after school assiduously studying the language on his own. "Every day, I would copy what the teacher wrote on the white board and check words I didn't know in my dictionary. I could manage conversational German in just one month." At 13, when he inherited his father's old computer, the public library in Neu-Ulm became his favourite haunt. He would head there each afternoon after washing dishes at his parents' restaurant. "I spent a lot of time playing with my computer because the library had free Internet access. "I'd surf the Web to see what I could do," he says. "I found out I could make money by building websites which attracted people because these also attracted ads," he says. At 14, he set up an online forum for netizens to discuss computing. His first "pay cheque" of US$250 came from Google. By the time he was 16, he had built more than 30 websites, which made him between US$4,000 and US$5,000 in advertising revenue each month. "I set up different blogs or sites for different topics, from China to the stock market and financial wisdom." Content for these sites was outsourced to writers and journalists, including those from German news magazine Spiegel. "I'd just give them some keywords and they would write. Depending on how much they wrote, I'd pay them between €15 and €20," he says. He flashes a cheeky grin, acknowledging the audacity of a teenager commissioning articles by seasoned hacks. "Hey, it was very easy for them, they could do it very quickly. If they could write two articles a day, 20 days a week, they could earn an extra €800 a month. It was good pocket money," says Mr Shi, whose parents had no inkling their son was raking in such a lucrative income. By then, he had decided what he wanted out of a career. "I wanted to be free. I wanted a job which would allow me to work anywhere and any time. "My first option was to be a professional poker player. There were always poker tournaments on TV with big prize money such as the WSOP," he says, referring to the World Series of Poker. Although he took part in some competitions, he decided he was not very good. So he gave up that dream. The stock market, he decided, was not for him either after he lost money investing in a couple of German renewable energy firms. So he decided the Internet was his best bet at a comfortable life. He was already a rich 18-year-old when he became a computer science undergraduate at Goethe University in Frankfurt in 2007. However, he dropped out after just three semesters into his course. It was not because he could not keep up. But his online business - website building, media buys and online promotions - had grown much bigger. "I wanted to minimise my opportunity cost," he says sheepishly. Asked how much he was making, he breaks into an embarrassed laugh before replying: "I can't disclose but it was a lot of money. It's not good to write that in the newspapers." The first thing he did when he quit university in 2009 was to get himself a business-class ticket to travel around the world. He zigzagged across Europe and visited Singapore for the first time. But a life-changing incident took place two months after his globetrotting adventure, when he flew into Shanghai from Tenerife, the largest of the seven Canary Islands in Spain. Because he was running a high fever, the immigration authorities in Shanghai feared he might have swine flu and quarantined him for one week. He didn't but the infection he had was serious enough to warrant a one-month stay in hospital. His life turned an unexpected corner. Although he would visit his grandparents in Shanghai once every couple of years, Mr Shi - who holds a Chinese passport but is a German permanent resident - had never entertained the idea of working in China. "The German media was very negative towards China then. A lot of people, including my father, said the boom in China was fake and wouldn't last," he says. But his quarantine and subsequent hospitalisation opened his eyes to how rapidly Shanghai and China were growing. He decided to stay, a move also prompted by his desire to be near his ageing grandparents. "I think it was destiny that made me fall ill," says Mr Shi. "I had no Internet access when I was in hospital and during that time, my one-man show was affected. "I decided to start again and run a longer-term business on a more consistent basis." Other pull factors? The big pool of Internet talent in the country and costs, which were at least 60 per cent lower than in Europe. In August 2009, he started Avazu Advertising, which offered multiple mobile advertising platforms for performance-oriented advertisers in a small office opposite Shanghai Jiao Tong University. "From Day One, the focus has been on a global market," he says, adding that the company's first clients were those from his one-man-show days. Within one year, the company was profitable. Three years later, it chalked up profits of more than US$10 million. In 2013, he set up Avazu Holding and branched into other areas, including mobile game development and publishing. Two years later, in a 2.08 billion yuan (S$426 million) deal, Avazu merged with public-listed entertainment company Zeus Entertainment. Not long after that, Mr Shi started DotC to develop and publish mobile apps. The company has launched several products in different markets, including Swift Wifi, a Wi-Fi platform that shares free passwords. "People looking for free Wi-Fi just need this one app which tells them where the hot spots are and the passwords they need." In June, Avazu became a wholly owned subsidiary company of DotC. 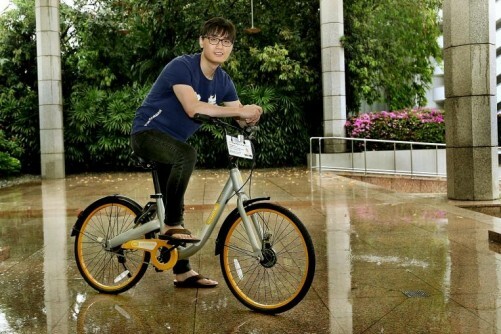 Always on the lookout for new ideas, Mr Shi also started oBike, a stationless smart bike-sharing company in Singapore early this year. Since then, the start-up has penetrated 11 markets, including South Korea, Britain and Australia. Two months ago, it secured US$45 million in Series B funding. Mr Shi is well aware that there are detractors who think bike-sharing is a money-losing proposition and that oBike is cycling towards failure. History, he says, has shown that the business models of great companies are often not understood. "Nobody understood 20 years ago what Google was doing. And nobody knew 10 years ago what Facebook wanted to become. "But I have full confidence in what I'm doing. We have a long-term vision. We want to better the lives of our users with our technology and promote an eco-friendly mode of transportation," he says. Asked how he stays sharp, he replies: "You must always feel that you are skating on thin ice. If you don't have this feeling, you won't get the push to move things forward faster. "It's a bad sign if you feel the ground beneath you is frozen solid. It means your company is getting more complicated in structure and you are moving slower. It also means you are not sensitive any more and will lose opportunities. "And if you're not careful, you may end up being disrupted by people in your own space, or outside of it," says Mr Shi, who is married to a former civil servant in the United States. The couple have a daughter who was born a few months ago. Wealth appears to have spared the soft-spoken technopreneur the narcissism and self-entitlement it infects many others with. Two years ago, he started the Shi Yi Foundation for Innovation at Goethe University. "It builds labs in the university, and supports studies which can offer innovations and solutions in different areas." His definition of innovation, meanwhile, is a thoughtful one. "Innovation is the result of many failures. If we want to promote innovation, we have to be prepared to fail and to accept failure. We have to appreciate people who fail." A version of this article appeared in the print edition of The Sunday Times on October 01, 2017, with the headline 'Health crisis opened his eyes to China's potential'.